We are a young Artisan Italian Company and we assemble in Italy Cargo Bicycles and Work Tricycles that we sell directly both in Italy but also, we export abroad. We were the first in Italy to understand the importance of Cargo Bikes as means of transportation in town centers, and already since 2011, we produce models targeted to specific needs, both for waptorking and also LeisureTime. 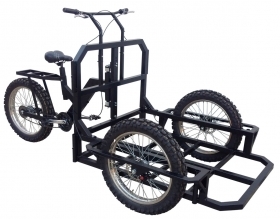 We are continually exploring new needs for prepare Cargo Bikes more suited to the needs of our customers. Clicking here on CATALOG and PRICES , you can visit our Catalog on Line and you will find All our Products for Sustainable Transport on pedals and all Street Food Carts that we have made. For each Item You will find the PRICE and what is included in that Price. The same we can prepare Handmade on commission for you, with the customization that you want. The photos of prepared Carts on Tricycles that you will see in this Web site, are only indicative for to have an indicative estimate of how much the investment could be. If you want, we can help you to choose the mechanics base that fit best your needs or your project. WHY a Cargo Bike ? Cargo bikes with 2 or 3 wheels are the only SIMPLE and ECONOMICAL SOLUTION to the problem of Transport in Small Historic centers and in the traffic banned Area(TBA). Work bikes can also circulate in Areas with Only Pedestrian Zone. We have many different Models available, and the largest can upload up to 300 Kg. Thanks to the gears, are lightweight to use on pedal even on light climbs, but there are also versions with pedal assistance for to have light ride even at full load. We can also provide special batteries that allow autonomy of over 30 Miles. There are already many people and companies that are adopting these, because thanks to this velociped with 3 wheels, you can get unimaginable Savings in terms of time, cost of manage, easy of parking, no need to purchase Eco Pass and a strong return in terms of image of environmental respect. Cargo Bikes are also an excellent advertising tool. HOW You can have Benefit using a Cargo Bike ? Think about a Kiosk or at a small Bar in downtown, that not having space you use a warehouse at 100/200 mt from the local and, whenever you need supply beverage refrigerator, someone must take his car, lose the parking so laboriously conquered, move, look for a new place to park the car, load the crates of soft drinks, return to the Bar, download and then start the "Parking hunt". Think also about some fine for forbidden parking? And may be all this traffic to suffer several times a day?? Delivery of products door to door in historic centres (es. Supermarket at home, pizzas, mineral waters): in fact, it can also circulate in Traffic Banned Areas, and when are configured with a Suitable Box, allows you to do many more deliveries than you could do with a Scooter, without having to re-enter. Distribution of Promotional Materials, Flyers or Newspapers. Cleaning Service Companies to transport tools and materials required within large areas. On Farms or for the transport of the harvest of Orchards. Carrying Suitcases and luggage in Resort or HOTEL, when customers arrive or depart. Municipalities, for Ecological Operators for various services or small transports. Individuals Private People who may use it for leisure, as Cargo Bikes, shopping transport, equipment for the beach when you are on holiday or to entertain your children (configuring it properly).It's a wonderful Cargo Bike. Diving Centers, to transport groups of cylinders. Promotion Agencies that organise events or Advertising Agencies, to give in rent to their customers to promote products. As an Advertising Tool for your Business, setting it with your advertising, may be transforming it with a style very "Vintage". Fairs, that can make them available for exhibitors , for moving equipment and setting up the Stands in areas where you can't enter with motor vehicles. Moms who want to carry the groceries, and perhaps accompany children to school. An Ice Cream Cart on Tricycle Cargo Bike, can be a good Attraction outside your Ice-cream Shop and has great power to intrigue passersby. It also has the advantage of being able to move independently around a district and sell Ice Cream where there are more passing potential customers. We produce various models of Ice Cream Cart. There is a model of cart that can working only with Plug 220V, and it is adapt for standing outside from a Shop, like a Ice Cream Corner. This solution is simple and can be an economic solution. The tricycle that you see in the picture is the Ice Cream Cart OMAR 11 Flavors and works with Battery for almost 10 hours in complete authonomy. The front Freezer is made in Fiferglass and it's very light and easy to pedal. The freezer can hold 11 stainless Steel Cylindrical Buckets tubs with 7,5 Lt. In total can mantain 55 Kg of Ice Cream. It works independently connected to a 220V power outlet (while charging the batteries), but during the traveling function, works in batteries for about 10 hours, depending on the External temperature. It's equipped with sink Hand Washing with clean water tank, and Recovery Tank for gray water. The Freezer is not working with Glycol or with Eutectic Plates, but it internally ventilated, and works with 2 Compressor DANFOSS and the temperature is mantained costant with digital thermostat. This solution is ideal for those that wants really make the itinerant selling of Ice Cream. The Tricycle is made for Heavy Duty and it is very strong and it can working on stones Stone paved Floors. An Ice Cream Bike Cart can be also a grat idea for Creative Ice Cream Franchising. When You are choosing an Ice Cream Cart is important to make a rational choice, not only based on the aesthetic factor, but mainly on the functional. It 'important to decide whether you want to use it, mainly so Static in front of your store, or if you want to mainly use it outdoors in itinerant manner and in complete autonomy (for example without the possibility of having the 220V Plug). Obviously the Static tricycle with autonomy of 1 or 2 hours will be a cheaper solution, it will have a lower price because it does not have a Special Compressor 12V , no battery, no battery charger and so on. If you would rather be traveling for about 8/10 hours , the Ice-Cream Cart will be equipped with batteries which require about 8/10 hours to recharge. For to mantain the Tricycle at a Light Weight, the Freezer have to be made in Fiberglass and must have a Very Good Quality Complessor, working both with 220/110 Plug and as an alternative with 12V. For Very High Autonomy (up to 10 hours or more), we use special batteries. 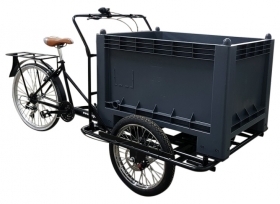 Our handicraft company Cargo Bike, with the help of a specialized company in the freezer, has developed a tricycle with a freezer LIGHTWEIGHT with Fiberglass Insulated body and compressor battery, which can arrive at a range of over 10 hours. This tricycle is light weight and easy to handle and particularly suitable to move effortlessly. We are talking about OMAR 6 model, that you can find by clicking on the link to our catalog with prices. This tricycle is very light and independent. As for the cooler, we strongly reccomend don't use a glycol freezer although these kind of freezer are the favorite in the world of Ice Cream (rightly because they are the most professional solution). The glycol Freezer have the big problem of being very heavy. They can weigh almost 400 kg (against the 130 of a ventilated Showcase fridge. A glycol Freezer has such a high weight which makes it impossible to move more than a few hundred meters and generate big sollecitacion to the frame of tricycle, causing possible mechanical failure over time. There is a big difference between riding in. 400 Kg or 200 Kg (Freezer + batteries). For this reason, we at Cargo Bike, assemble on our Ice cream Carts always Ventilated Freezer and not glycol Working. 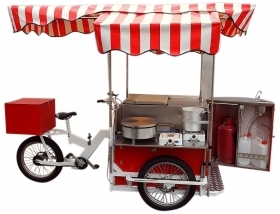 In our CATALOG of STREET FOOD CARTS you will find Prices of our Carts and many ideas on how to Start an activity in Street Food, using a 3 Wheels Bikes human powered, fitted as Workbench for Cooking Food in the Street. With an accessible investment you can buy a Street Food Cart prepared for Cooking food in the Street on a 3 Wheels Bicycle or Tricycle . You can also find information on how to create many ideas about your potential business in Food Street. In the Photo Gallery of our Shop on Line you will see many photos of Tricycles and bicycles prepared for the itinerant sale of food in the Street . By clicking on this LINK, you can also enter in our Web Sites and you will know us better and to ask at any time more information about our Street Food Carts, Hot Dog Carts, Crepes Carts, Grill Carts. The Tricycle prepared as Itinerant Bike Fryers for Street Food, has a high return on investment. With this Fryer Cart can be prepared pancakes, churros, Turnovers and everything that can be fried. It's a Street Food Cart with a 30 Liters Fryer Powerful enabling high productivity. This is a perfect Cart to attend fairs, banquets, events, and in all those situations where people go hungry .... !! !